For my most recent clients it has been an excellent autumn so far, especially in regards to numbers of bass caught on lures if not the size. Indeed, there has only been one session in the last sixteen in which a client hasn’t caught one – although I have to admit there hasn’t been any over 3½lb within these sessions. Something that pleases me greatly though, is that many of these clients have come to me from a wonderful array of angling backgrounds yet they have been compelled, for a variety of reasons, to take up bass lure fishing in a big way. When I come to review 2018 it will undoubtedly standout as a season in which I have been privileged to assist many, many anglers to catch their first shore-caught, lure-caught or first ever bass – which as you can imagine is something that fills me with a huge amount of pride. One the group of sessions that I enjoyed immensely was with a very nice Italian chap called Arturo. He had made the long journey down from the big smoke to join me whilst staying at the excellent Chillington House B+B Hotel which is down the lane from me and is where most of my clients stay overnight (it is also where my 3 Day Package clients are accommodated). 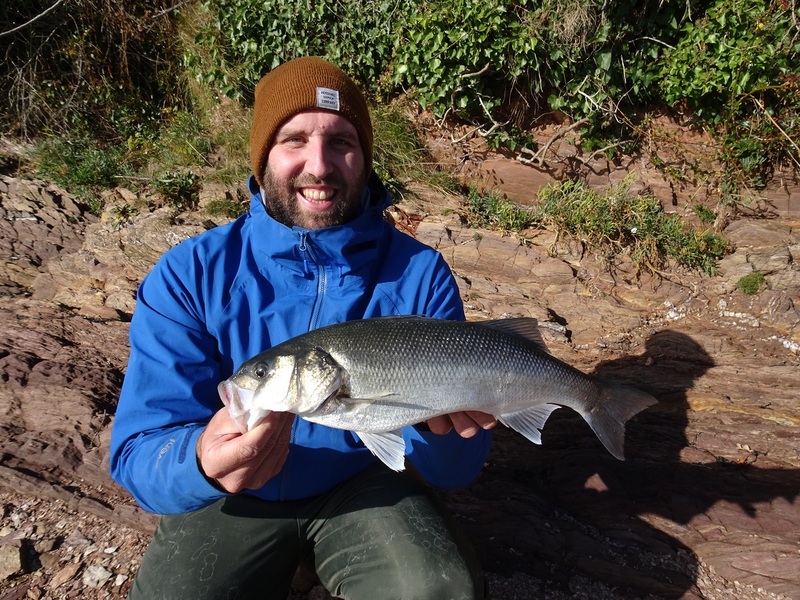 Although he had caught his first ever bass the previous week on a lure from a tidal lagoon, this would be the first time he had fished the wild, rugged and open coast. 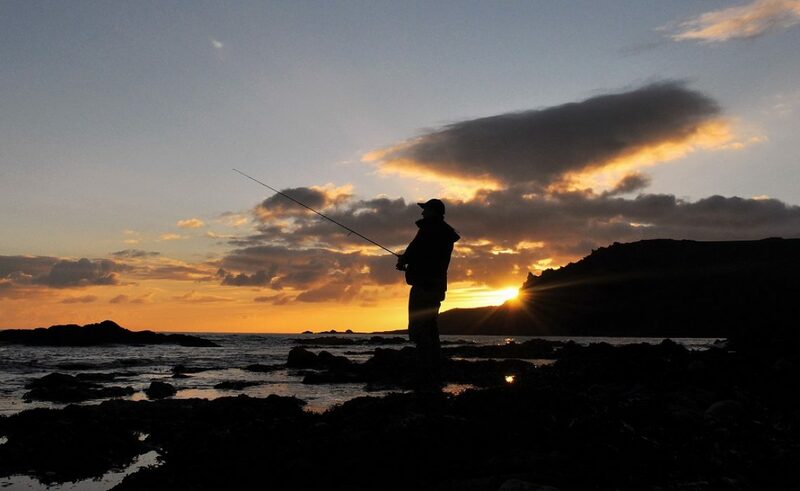 What a fantastic way to whittle away an afternoon – bass fishing along the south Devon coastline. The highlight of his time with me was the final morning session. I made a decision to trek to a different stretch of coastline from the previous day as the bass just weren’t there in numbers. It turned out to be the right decision too, as Arturo landed nine bass in a frantic four hours all on a lure I intend to write a review about – the Xorus Patchinko 125 here. On day one the bass were hard to come by despite the decent sea conditions. This one fancied one of the lures that I suggested Arturo should purchase – the Daiwa Shoreline Shiner 97F in the Black Back Flash pattern here. That final session capped off what had been a pleasurable couple of days, and even though all tof he bass landed were only in the 1-2lb range it brought a great deal of satisfaction and accomplishment to someone who is new to this area of the sport – cheers Arturo. Probably the most stylish bass angler you’ll ever see on the shoreline! You’d have thought it was still mid-summer judging by how warm and sunny it was when I guided Charlie and his two brothers (John and Andy). The bass were very hard to come by during this session but Charlie did manage one (below) close to some white water breaking around the rocks on a very inexpensive (yet very effective) surface lure – the HTO Canine here. Another client who has been ‘dying’ to catch a bass for a very long time – you did it Charlie! It was a memorable day on many levels, not least because they were such great company, but also the spectacular sunset that we were all fortunate enough to witness. A wonderful end to a fulfilling day. The fact that the they’d chosen to be guided by me on what was the first time they’d all met up in nine years was quite humbling. I am lucky enough to meet some very pleasant and very receptive people in the course of my guiding – with Adam most definitely being one of them. A very experienced angler, it was more consistent results moving forward and the reasons why he had caught bass from certain areas and in certain sea conditions that he really wanted to learn. A ‘striking’ bass and another one this season that fell to the charms of a well worked ‘Patch’ 125. Upon searching through his lure collection I could see instantly that he’d put a lot of effort, and more importantly ‘thought’, behind the colours, shapes, diving depths and movement created by them – he’d done a very good job! But it was one of the most consistent lures that I’ve seen used to devastating effect this season (the Patchinko 125 here) that I picked out as ‘the one.’ Sure enough, following a spell of patient searching of the mark and underwater topography that I’d described to Adam he was rewarded with the ‘perfect’ bass above. A lovely bass that went a long way to proving to Adam that surface lures work very well when the sea is far from calm (hence the life jacket). The video I captured below is one of my favourites from this season as you can see every detail on the bass and it really didn’t seem any the worst for being caught. Returning clients I am very pleased to say, are a regular occurrence for me, but this time someone who has offered me a great deal of advice and encouragement (Johnny) brought along his fishing mad nephew (Jamie) for the ride. The first session produced a small bass to a white needlefish in darkness for Jamie (which blew his mind at how close the bass took the lure) and on the following morning they fished the same beach but in much rougher sea conditions – conditions that had me convinced the bass would be working ‘the trough’ of the beach and where the undertow was most powerful. Rather frustratingly for me however, was that the only bass caught was during the five casts that Johnny insisted I make with his new Major Craft Triple Cross rod here. – bloody typical considering it was a decent one too! There was no way I was having my picture taken with this bass! As expected, it walloped the lure right where the shelving sandy beach levels out onto flat rock/reef. The successful lure is (yet again) the Daiwa Shoreline Shiner 97F here. Clearly, I was now even more determined (hell-bent actually) to place them onto a bass each. But with a hard frost forecast overnight (which was very early in the Autumn for where I am in south Devon) and a calm and beautiful sunny day to follow I knew I would have to choose the right mark for the conditions. As we trod a long path that winded through the woods and then traipsed across a frozen field I could sense the excitement (or was it trepidation!) in my clients’ demeanour! Onto the mark, I instructed them to use small surface lures initially with the thought process being any bass present would react to the ‘splashing’ without really thinking due to the clear water and bright sunshine. The bass were more than likely present all along, but just weren’t interested in the surface lures on this particular morning. It was after an hour or so, right on high water that I asked Johnny to attach one of the 6″ OSP DoLive Sticks that he’d brought along, and to fish it very slowly with the odd twitch. Five minutes later and he latched into the bass above that grabbed the lure as it was brought to life at the start of the retrieve after he’d initially allowed the lure to sink naturally to the seabed – a tactic that has worked many times previously over similar ground. No messing around here! You can just about make out the 6″ weedless soft plastic lure hanging out of the mouth of this hungry bass – such predators! Within seconds, I’d changed Jamie over to an identical lure and proceeded to talk him through how to work the lure. With Uncle Johnnie’s words “I’d love Jaime to catch one now” ringing in my ears I watched him like a hawk, tweaking his technique every so often before stepping back to base camp to grab my pasty… Just then “Yep! I’m in”, he shouted. I could tell it was a better bass as it approached the weedy margins in front of us, as it attempted to glide to his right with that slow thudding effect visibly shaking Jamie’s rather sturdy four-piece rod, and I had to wade in up to my waist with the net in order to make sure the fish didn’t tangle itself in the bladderwrack – Yes! In she went. A cracking bass taken on a cold, frosty, yet very sunny morning in very clear water – you’ve got to love these fish! To say we were all pleased is an understatement, as I’d felt terrible about landing the only fish during the previous session (that’ll teach me not to have a play with my clients set ups!) and with Johnny adding another small bass not long after it had been a glorious morning all round. With the sea having been whipped up into a dangerously unpredictable state during the southerly gales we’ve experienced it was during a recent lull that I was able to guide another returning client – this time the fishing fanatic that is Ewan. Having landed a few bass on surface lures during his last visit lure fishing in darkness was the next method he wanted to learn and experience – so it was back on the night shift again. The mark I chose is one of the few places where I will fish in darkness when the sea is relatively rough – the reason being that it is a shingle beach with (for me) deep water of 12-15ft close in. Additionally, it actually produces more bass when the conditions are like this with a specific type of lure being very effective – the wobbling, fast sinking Super Strike ‘Super N Fish’ Needlefish here. I believe that their ability to remain more ‘stable’ and deeper down in the water column in the powerful, laterally running tide alongside the strong undertow found on this mark, is the secret to their success. Providing they are still cast up-tide and retrieved with the direction that the tide/current is flowing there seems to a zone, around 15m out from the shingle where most of the bass have hit it. Again, it is where the shingle meets the reef and is the narrow strip that the bass seemingly swim within. The predatory eyes of a bass that still managed to track and attempt to eat what I believe the they think is either a squid, cuttlefish or docile fish – I elaborate on this theory in my recently released book. In quite tough conditions (as there was quite a bit of floating weed to contend with) Ewan managed to land two respectable bass and had four other ‘hits’. But… You know what is coming! Yes, he latched into something that he said felt totally different and a hell of a lot more powerful – which considering he has caught a Blue Shark on a fly this season means I will take his word for it! I’d only said to him a few minutes earlier that, if a big one hit the lure, it would just stop dead and the rod would progressively bend and line would start being pulled from the drag – which is precisely what happened until after only a few seconds of being connected to the fish, the hook-hold failed… What a shame. Until you get to hold your first lure caught bass in darkness you could be forgiven for doubting it works (I know I did). However, I can assure you it 100% does! As I write the sea temperature around my local coastline is around 13.5ºC, which if I heed the historical form of past years means that there is still plenty of time for a client to latch into a monster. Indeed, I managed a very nice bass earlier this week alongside many other smaller ones in the past two weeks that I will write about in the comings days in a ‘My Recent Catches’ blog post. If you are interested in a late season, guided bass fishing session with me, I can be contacted here.